Microphone Self Noise Test Sequence – Listen, Inc. 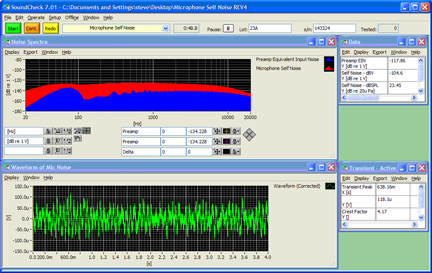 The purpose of this sequence is to measure the self noise of a condenser microphone. To do this we use the spectrum analysis step and a power sum calculation to derive an RMS rating for the unit under test. The sequence has several parts, a few of which are optional. The first section begins by prompting you to enter your mic preamp’s gain. If your preamp does not have a gain setting with labeled detents you may wish to use the ‘Gain & RSP’ sequence located in C:SoundCheck 7.0SequencesElectronics to determine this value. The next part tests the preamp’s self noise so that the system can determine whether or not you have a high enough signal (signal being your microphone’s self noise) to noise ratio to accurately measure your microphone. The third part of the test takes a measurement from your microphone, creates a spectrum, accounts for the preamp gain, applies an A-weighting, and finally calculates the power sum. The final part of the test prompts you to enter the sensitivity of the microphone if it is known. The resulting display provides you with the equivalent input noise of your preamp, the self noise of your microphone in dBV, and also a result in dB(A) after factoring in the microphone’s sensitivity. You’re also provided with the waveform, a maximum voltage level, and the crest factor to check for sharp transients. Caution: Unless you are testing a microphone with a very high noise level you will likely need a preamplifier to provide gain. This preamplifier has to be rather quiet, so as to not interfere with the measurement. For the first part of the sequence, measuring preamp noise, you’ll need to terminate the preamp’s input with a 150 ohm load across the high and low pins. For an XLR preamp this can be easily accomplished by soldering a 150 ohm resistor across pins 2 and 3 of an extra connector. When measuring the self noise of your microphone you will need an acoustically isolated enclosure. Depending on the microphone’s noise level, sensitivity, and ambient noise levels this may be as simple as an anechoic test box. Studio-grade condensers with very low noise levels will likely require something even more highly damped. 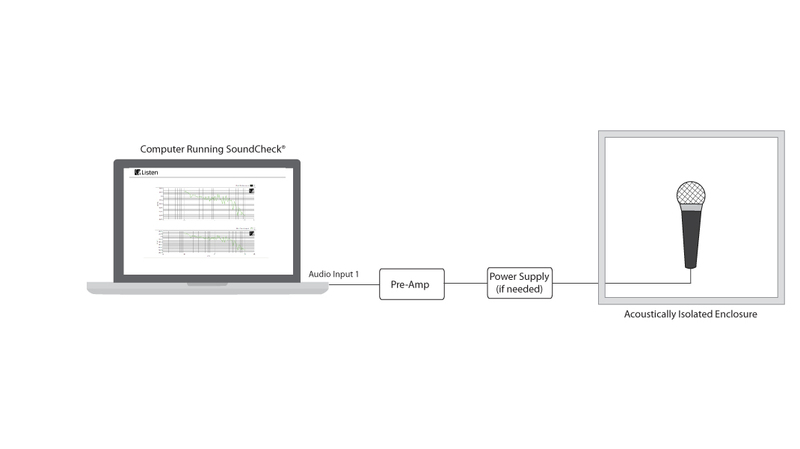 Setup the input channel of your hardware step to use 24 bits. This will give you the lowest noise floor for your soundcard. If you always use a fixed gain in your preamplifier you could remove the sequence prompt and correction post processing steps and simply enter your gain into the calibration step. If testing in an anechoic chamber it would be possible to add a quick check for the microphone’s sensitivity after doing the noise test, rather than entering the value manually.